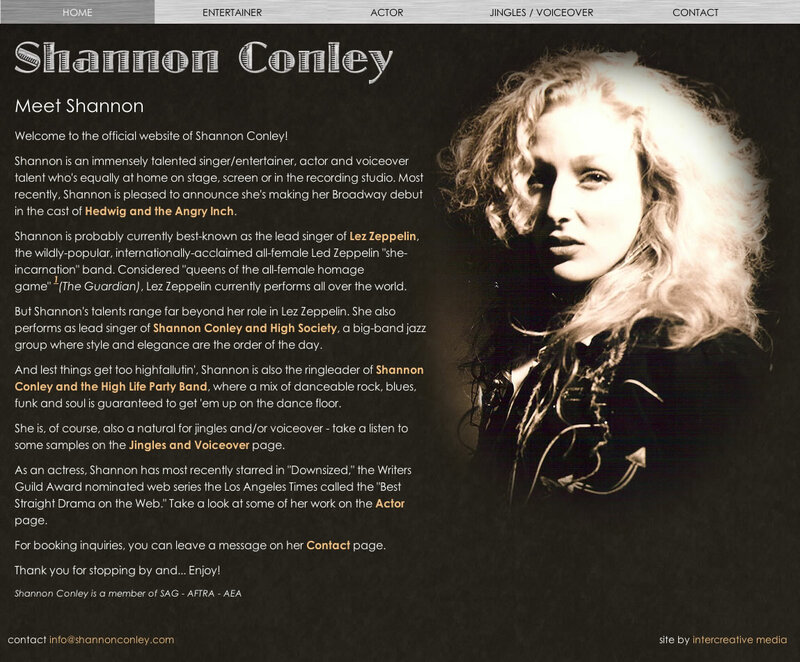 Shannon Conley is a brilliant singer, actor and entertainer - she's probably currently best known as the lead singer for Lez Zeppelin, renowned all-female Led Zeppelin tribute band. As of this writing (May, 2014), Shannon is understudying the role of Yitzhak in the acclaimed, Tony Award-nominated Broadway production of Hedwig and the Angry Inch, starring Neil Patrick Harris. When Shannon needed to update her web presence to reflect not just her Broadway debut, but to showcase her other talents, she turned to InterCreative. Her Actor page also features an attractively-styled résumé (with download link) and video excerpts from some of her performances as Astrid on the award-winning web series, "Downsized." We were thrilled to have the opportunity to work with Shannon and have nothing but high hopes for her continued success... stay tuned!